Cargo Cosmetics Swimmables Collection is known for their waterproof blushes, bronzers, eye pencils, eye shadow sticks, brow pencils, lip pencils, liquid lipsticks, waterproof mascara top coat and the newest addition, the Swimmables Longwear Liquid Foundation. Shaping your brows to perfection is key to framing the face but locking that look in place during sweltering heat can be tough. 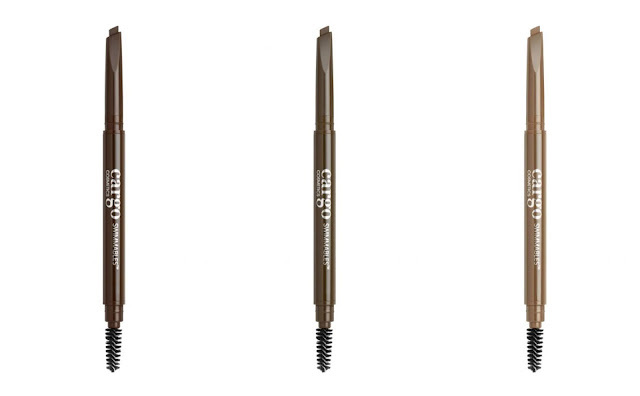 Enter the Swimmables Longwear Brow Pencil from Cargo Cosmetics! The special blend of natural waxes hold hair in place and dry to a waterproof powder finish for full-looking, long-lasting brows. Cargo’s legendary Swimmables formula locks into place for a budge-proof finish — it only comes off when you take it off! The slanted tip of the brow pencil makes for easy application in achieving your perfect arch. The dual-ended pencil features a spoolie brush to comb through product and brows for a natural look.